bl.uk > Online Gallery Home	> Online exhibitions	> Asia, Pacific and Africa Collections	> Ajanta: Cave XIX. Dagoba. 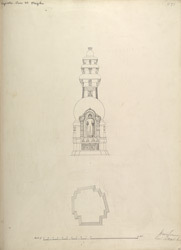 Illustration of the dagoba from the Buddhist chaitya hall, Cave XIX at Ajanta from James Burgess' 'Original Drawings from the Buddhist Rock Temples at Ajanta.' The Buddhist cave temples of Ajanta were excavated into a horse-shoe shaped cliff overlooking the Waghora River in the 2nd ? 1st Century BC. Cave XIX is an elaborate rock-cut chaitya hall from the late 5th Century. The external facade has a large horseshoe-arched window flanked by figures of yakshas and Buddhas carved in relief, above a columned portico. The outer walls are decorated with carved figures of seated and standing Buddhas, and columns embellished with scrollwork, foliation and jewelled bands. The side chapels on either side of the facade have columns with carved pot and foliage capitals. The dagoba, or domed shaped structure of the Buddhist chaitya hall, "has umbrellas wholly in stone, reaching almost to the roof of the cave. No other dagoba in any other cave has as many as three, and in the caves with arched roofs these are generally in wood."